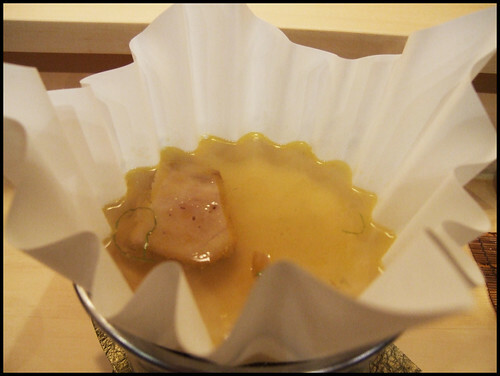 I’ve reported on Urasawa before – it’s one of the very best restaurants in the country. Los Angeles might be a superficial slum to some, but more integrity and soul go into each Urasawa dish than any restaurant I’ve visited. Each dish is meticulously crafted and lovingly served. 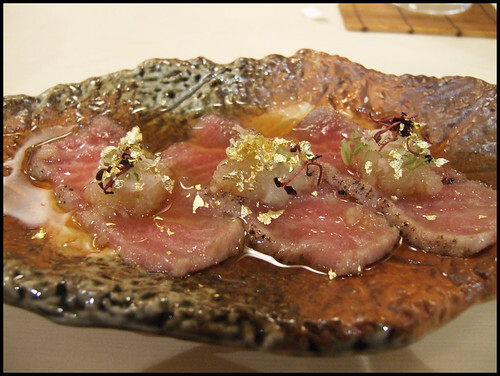 Urasawa almost transcends its restaurant digs – it’s more of a temple for food. Here are the photos from my meal last week. 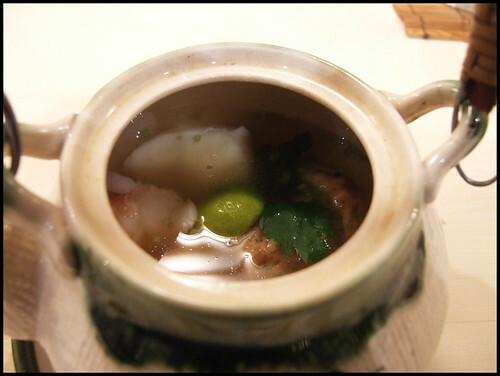 The first few courses are usually the same, ingredients and variations changing with the season. Then the usual onslaught of sushi arrives. This meal was easily my best Urasawa meal – everything was hitting on all cylinders – it gets a spot in my A1 Best Meals section. The beef, pictured below, prepared 3-4 different ways, was incredible. The toro, the rare item of his I find not always up to par, was excellent – fatty but it still had a fairly intense taste. The abalone was perfect. The (many) live prawns & lobster – sweet. 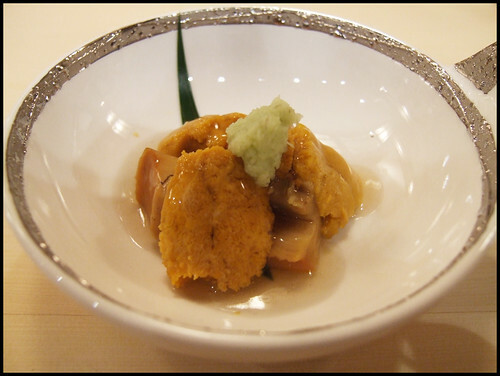 The uni was very firm, foie-like creamy, and quite sweet. If you’re in LA and skip Urasawa, you’re doing yourself a great disservice. 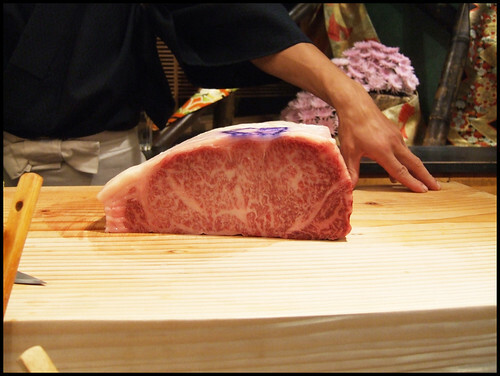 Kobe Beef “A10″ – There are 12 grades of kobe beef 1, A12 being the highest, but the chef said A12 is too fatty for more than one bite. The A10 was a good compromise for serving across several dishes. I’ve never seen more marbled meat. For those that say “you haven’t had Kobe til you’ve had the real thing” – they are absolutely correct. This would put any “wagyu” you find in top-tier American restaurants like The French Laundry to shame. 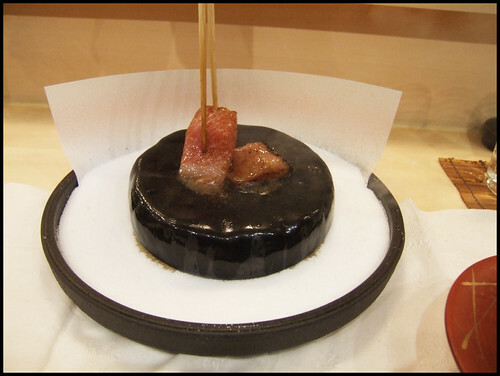 The meat was served in a variety of ways – cubed and grilled, sliced for shabu shabu, and thinly sliced and grilled for sushi. The grilling was done for a few seconds – enough for a char. 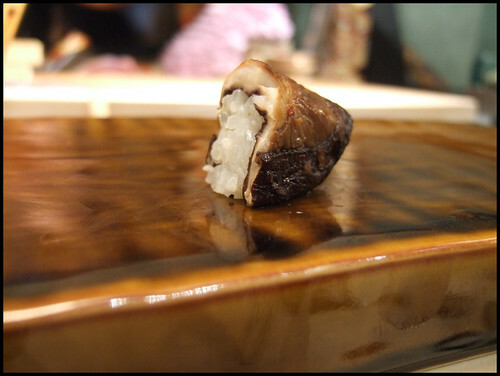 The piece of sushi was the best preparation where the intensity of fat may have been a bit too much in the cubed and grilled piece. There is no recommendation high enough for this restaurant and it’s a must-visit for Los Angeles. The chef, Hiro, used to train under Masa; in fact, this restaurant is in the old space of Masa’s former LA spot. I think Urasawa is better than Masa, but they are both in the same league. However, Urasawa is about 60% of the price, with ingredients that are just as good. Masa seems like a get-rich-quick scheme; Urasawa feels real. My Masa meal lasted 2.5 hours; this meal lasted 4.5 hours. as for Anthony Bourdain, I’ve learned long ago not to trust him for anything but entertainment. How does one go about getting a reservation? How many seats in the restaurant? Have you walked in? Hey Chuck What the ____! If your still in la take a trip down to San Diego to check out Addison restaurant at the Grand Del Mar. It easily competes with some of the best restaurants in the country. I know its in San Diego which is lacking in the restaurant scene but I guarantee you will enjoy your meal. chris, there are 10 seats. reservations have never been an issue – this restaurant isn’t a scene so it’s probably relatively unknown in LA’s trendier circles. that, and there probably aren’t many people lining up to pay $250-300/person for a meal on any given night. a reservation is necessary however because he probably orders ingredients for the number of people attending that night. Aaron, can you give me any more info regarding Addison. I live in San Diego and am used to the terrible food that we have here so any information on how your meal was and what you liked/disliked/suggest would be great. 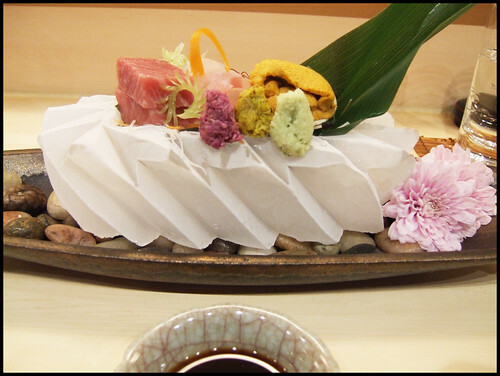 Never been to Urasawa but I am planning on making the drive up from San Diego next week for a meal. There’s actually no Kobe beef (legally) available in the US right now. There are only four slaughter plants in all of Japan licensed to process the wagyu beef that is imported here: one in Miyazaki, one in Gunma, and two in Kagoshima. None in Kobe. On the other hand, Kobe is not the most respected designation anyway… Also, the 12 point scale you mention refers only marbling; the meat is also graded for firmness and texture of the meat, fat color, etc. These grades are then converted into a 5 point scale, with 5 being the highest. Chuck — this meal looks absolutely incredible. Thank you for posting these pictures. Thanks for the info D Gordon. I knew of the 5 point scale but didn’t include it since we weren’t given a number for that. From my understanding, each of the prefectures uses mostly similar technique – what is the most respected designation? From Hiro’s POV, I’m sure it was just easier to say “kobe beef” than “wagyu raised in miyazaki”, to which most of his customers would just give him a blank stare. Thanks for the recommendation. I’m up in dark, cold Montreal Canada, where I can never get great Japanese. But I have a lot of family in California and I visit LA almost-yearly (when I can make it down). Your description and photos are amazing. I actually felt a little teary looking at them. I’ve got this pegged as a must-do next time I’m down in LA. Hey Aaron Martinez! This is your old buddy from The Prado! How the hell are you? Still T the Addison, huh. When I get back to California I’m going to stop through! Hope all is well with ya! 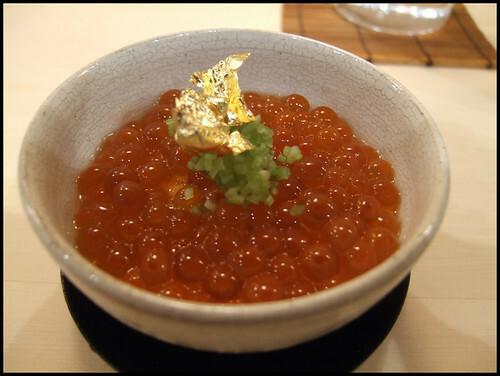 By Egg Custard with Ikura, do you mean Cold chawanmushi? 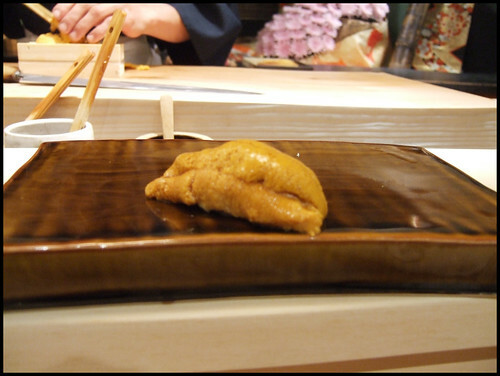 Toro, Kanpachi, and Uni sashimi: Great pic! Sorry it took me so long to write you back. Im traveling in Spain right now and I have been pretty busy. Addison restaurant is located in Carmel Valley. The restaurant is a little over a year old, and the chefs name is William Bradley. The food is modern french and very good. The ambiance is 3 star michelin quality and the service is as well. The food can hold up to some of the best restaurants in the world. I hope you go eat there soon and tell them that I sent you. Hi Aaron, Spain.. Wow! That’s pretty darn awesome. I’d LOVE to see some of the stuff you are doing! I’m in Houston still. I’m the sous at a country club and a bistro out here. Nothing too exciting but getting that experience. I now tell my cooks “have some finesse”! LOL.. email me sometime at nikiajoneschef2b@aol.com!